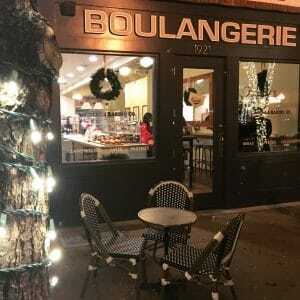 Lowest Greenville Lights Up This Saturday | Village Baking Co. If you’ve recently paid a visit to Lowest Greenville, you may have noticed that things are starting to look a little more festive. That’s because the holiday season is here and we’re all ready to celebrate! The Lowest Greenville Collective is at it again with another amazing community event. For the second year, the LGC is hosting Light Up Lowest Greenville! This is the night that our neck of the neighborhood officially comes alive with holiday spirit. As per usual, there’s something for everyone at this awesome community celebration. What Is Light Up Lowest Greenville? Light Up Lowest Greenville is a community lighting and celebration event hosted by the Lowest Greenville Collective. The Collective organizes neighborhood-wide events centered around local business and philanthropy. This event’s philanthropy is the Alex W Spence Middle School’s Peace Pantry: a no questions asked/safe place for students to get food and other needs for themselves and their families. When Will Light Up Lowest Greenville Be Happening? 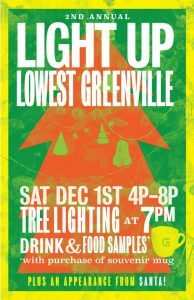 The 2nd Annual Light Up Lowest Greenville event happens this Saturday, December 1st, from 4 PM until 8 PM. Santa will be on hand at Greenville Avenue Pizza Company from 6 to 8, and the official tree and street lighting will happen at 7. This event is free to attend, and all members of the family are welcome! You can purchase a souvenir mug for $10, which comes with samples and specials from the local businesses of Lowest Greenville. The Lowest Greenville Collective is also accepting donations of canned goods and winter clothing for the Alex W Spence Middle School’s Peace Pantry. For your donation, you’ll receive a commemorative ornament that you can take home! 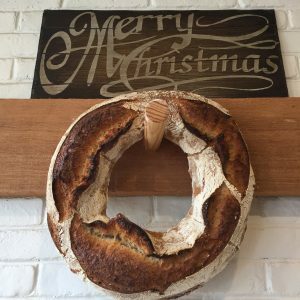 The holiday season is our favorite time of year because it inspires us to whip up all kinds of special bakes and seasonal items! We’ve been making Paris Brest and Lemon Poppyseed Eclairs. We’ll have plenty more treats in the coming weeks, and we’ll be accepting pie orders for Christmas pickup. We hope to see you on Greenville this weekend! 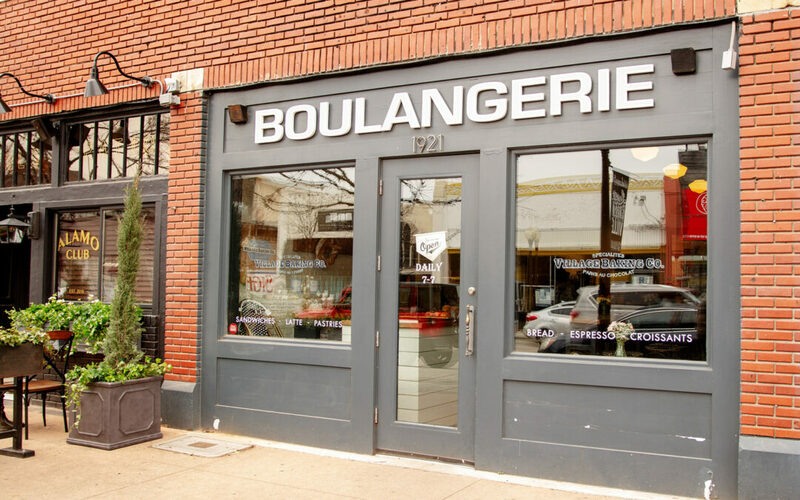 If you’d like to place an order or learn more about our offerings, you can contact either of our Dallas, TX Village Baking Company locations at 214-951-9077 (Woodall) or 214-821-3477 (Greenville).